The Thundertank is scaled for the 4" figures, as are all the other playsets/vehicles for the new series. I think she and her brother are short-packed, but I'm not sure. When they first started showing up in my area, the Wily kids and Cheetara were the hardest to find at first. Now you can get the entire team in one go at most stores around here. Well, aside from Snarf, that is. The 6" Classics are at Target. 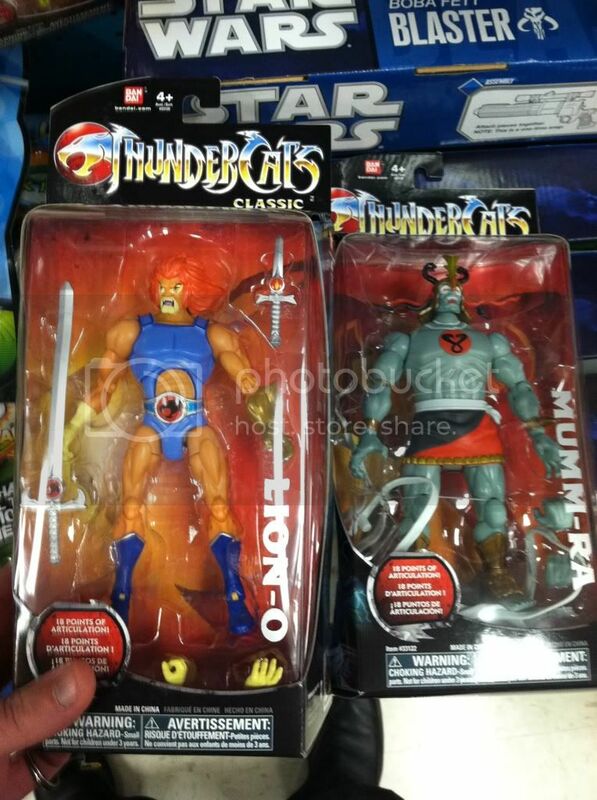 I'm not a Thundercats fan, but probably would've picked up the 6" Mumm-Ra if the lines weren't so long. The classics are AWSOME. 8" actually too. I don't know if anymore are coming out there for the classics . I am also assuming that is a "variant" Lion O with open mouth. Aaannnddd I didn't even know these were supposed to exist. I feel somewhat stupid for buying the 8" figures now. is there any way to increase the rigidness of the classics Lion-O Sword of Omens? maybe a coating of clear nail polish or something? I think The Driller's new design is FAB & I hope to see a new updated figure get released in 2012. Also I see Slithe is finally headiing our way soon but again any chance or news about him in 8 inch? The Thundercats classics line is looking great so far with Mumm-Ra, Tygra & Lion-O at present but lets hope we hear news of say Cheetara, Panthro, Slithe, Jackalman, Monkian, Vultureman, Rataro & Mandora. 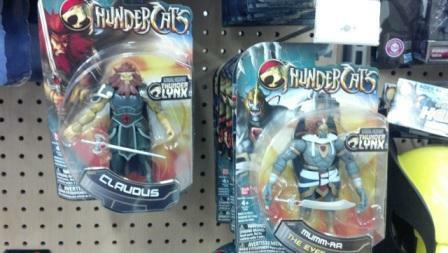 Just spotted 6" Cheetara, along with 4" Mumm-Ra (Everliving ver.) and Claudius at Walmart. Last edited by trebleshot; 01-11-2012 at 01:48 PM..
Loving the packaging art for this. Got Cheetara. Lacks the double jointed knees and elbows that the other modern figures have, and lacks bicep swivels. Disappointing but a cool figure nonetheless. I have to say too, the Classic 6" figures are quite good. They look less toyetic than the 8" Classic figures due to sporting a matte finish. Nice feel too. Too bad LionO looks like he needs dentures. I am so pissed that I bought into the 8" line. I wish they continue it. The 6" isn't bad looking but those screws... terrible! 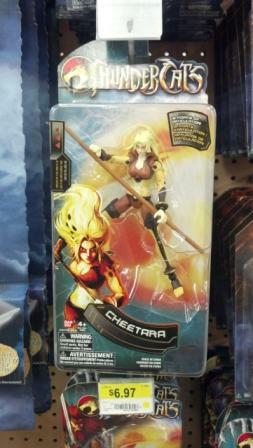 Anyone able to middleman a 6" Cheetara for a Canadian? I have someone trying to look for one already but no luck so far. No offence to thundercats.ws, but Thundercats really is the fandom where nothing happens! Everytime check over there the only news is the latest episode of the cartoon. Bandai really have dropped the ball on the figures, especially the Classics. I don't care what scale they're in, just give us some figures! I agree with above, sadly. I was at TRU the other day and all Cat figures were all on clearance; including the vehicles and playsets. Whenever TRU does that it means the line is failing and the chances of coming out with anything new is slim to none. I of course could be wrong. If they are releasing new figures, then their problem is not releasing them sooner. The thundercats are loose again!! If rumor true it is by Mattel and most likely sub based via Matty Collector, meaning having to deal with Digital River. Not sure I'd be up for a sub, but hopefully this means at least someone is doing something with the license. Better something than nothing, right Silverhawks fans? Third Earth Subscription listed as coming soon on Matty Collector. The release schedule for the subscription figures is: Lion-O, Jackalman, Pumyra, Mumm-Ra, Panthro, Grune and Jaga. I think I will try and get the main Thundercats. I like that line up, particularly that it alternates between villains and heroes. I thought that they were supposed to go up on the eleventh.